More and more homeowners are opting for concrete pavements and driveways when designing and constructing their properties. Concrete brings a massive number of advantages. 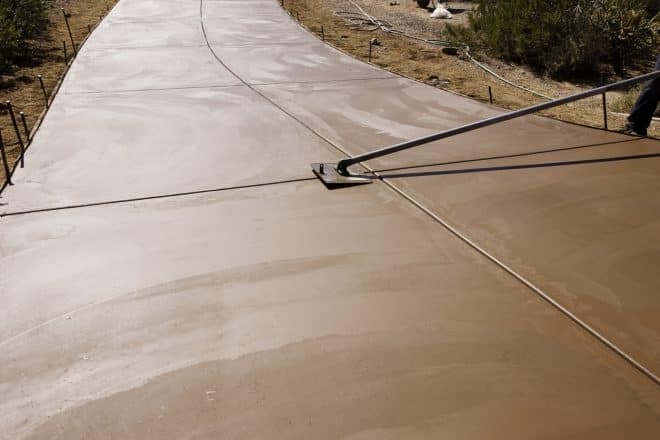 Concrete is durable, low-maintenance, versatile and cost-effective. Thanks to design techniques, concrete can now be much more than just a slab of grey, it can be used as a canvas to create almost any look you like. Modern design techniques mean that concrete is being used throughout all areas of backyard design. Many people now choose it for their driveways, paths, entrance and outdoor dining areas. So, with all these advantages, you’ve probably already been convinced on the merits of concrete for your yard design project. But now you need to choose the colour. Here are some things to consider. If you’re working with a large concrete area, you may want to think about using a number of colours or even adding a textural element. The choice of one colour, for a large area, can look quite bland and detract from the rest of your home. If you are going to go for one colour, choose something restrained, rather than big and bright, like orange. If you want to add a textured element to your concrete, why not go orange and stamp it to look like brickwork or even terra-cotta. Or, go blue and stamp it to resemble elegant bluestone. Areas such as driveways, paths and even outdoor dining areas receive a lot of traffic. These areas require the choice of a colour and texture that hide stains. Exposed aggregate concrete is a great option for driveways and barbecue areas because it hides blemishes. However, it should also be noted that exposed aggregate can’t be coloured. If you still want the freedom to colour, go for dark shades. That way, oil stains or drips from the barbecue will be hidden, thereby ensuring that you only have to get the pressure cleaner out every now and then. On the other hand, if you’re using coloured concrete for purely decorative elements, go for something striking and bold. What Does the Area Border? Choosing a colour for your concrete driveway is very different from choosing a colour for your garden paths or outdoor dining area. The colour of your driveway needs to suit your home’s façade, and that doesn’t necessarily mean matching it. A matched design can look great, especially with sandstone or light-facades, but if you have a dark façade, it’s a good idea to create some contrast. An overly dark pallet isn’t inviting and can make your home look smaller. If you’re choosing a colour for an outdoor area or garden path, you need to highlight the colours in your garden. Dark blues go well with pink or red rose gardens, and sandstone colouring goes great with anything red or tropical. To choose a colour, grab some of your flower petals and hold them up against a sample to see how they look. Is The Space in The Sun? Sun is an essential factor in choosing colours. Remember, dark colours absorb heat, and light colours reflect it. So, you don’t want light-coloured sections of concrete right out the front of your bedroom window if it’s going to reflect either the morning or afternoon sun. It will heat up your bedroom and create issues with glare. On the other hand, you don’t want dark coloured concrete in ‘barefoot areas’ such as pool surrounds. The heat will be absorbed, and the surface will be incredibly uncomfortable to walk on. The point of texturing concrete, via stamping or stencilling, is to make it look like another construction material. The beauty of this approach is that you can mimic high-end looks without paying high prices. However, you need to choose the right colour in order to get the right look. So, if you’re going for a brick look, make sure you choose a ‘brick red,’ not a loud, vibrant red. If you’re going for sandstone, make sure you select that colour and not just a generic yellow or orange. By choosing the right colour for your concrete areas, you open up incredible design opportunities for your home. Concrete is becoming the darling of the home design world, and you need to make the most of all the opportunities it presents. You should also keep in mind that it’s possible to colour existing concrete. So, you can give your tired concrete a facelift without having to rip it up and start again. Just ask your local concreter for advice on what would look best with your property.